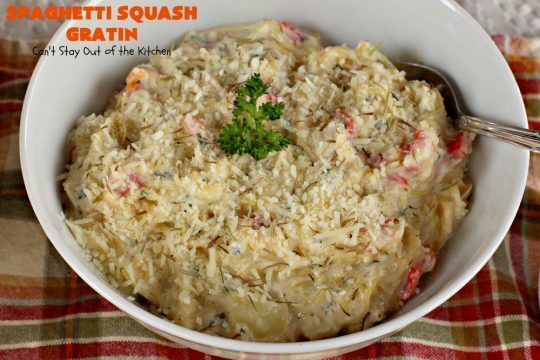 Spaghetti Squash Gratin is absolutely heavenly. It’s also a wonderful way to prepare spaghetti squash. 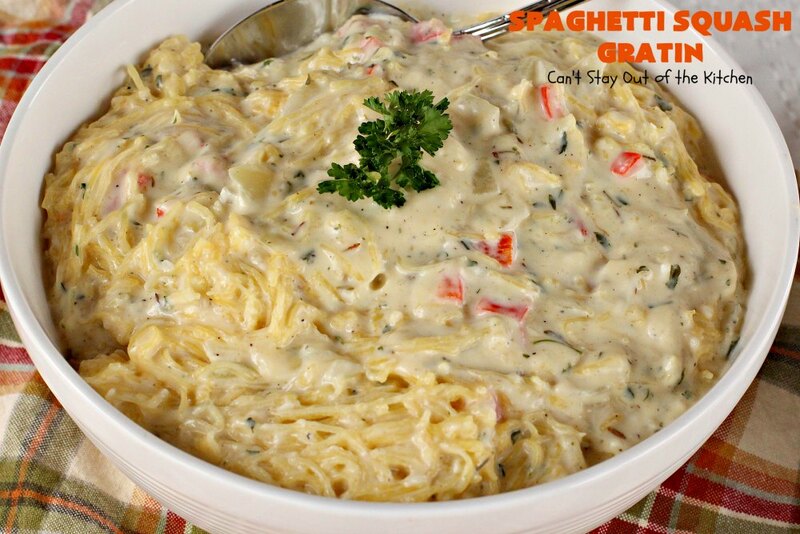 I prepared a thick, creamy, cheese sauce with gluten free flour. Then I added onions, garlic and red pepper for flavor, and parsley, thyme, rosemary, salt and pepper for seasonings. This dish was spectacular. The cheese blend I used is exquisite. H-E-B has an Italian cheese blend that is a mixture of six different cheeses: mozzarella, parmesan, romano, asiago, fontina and provolone which provides a marvelous combination of flavors that’s incredible. 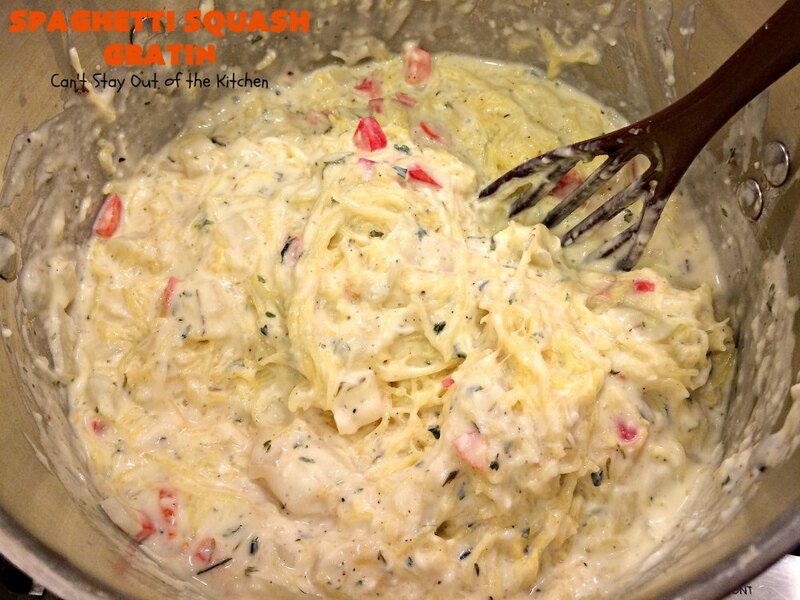 A few weeks ago I needed to use up a couple of spaghetti squashes that were going to go bad if I didn’t use them up. I went ahead and baked the squash and placed the squash in a bowl in my refrigerator for a few days trying to figure out a way to use it. That’s when I decided to try to make a cheesy gratin recipe with it. Wow, it was terrific. I loved the crunchy squash in this thick, cheesy herb sauce. I was telling our company about it last Friday night and the gal wanted to try it so I heated it up and went ahead and served it along with my Pepperoni Pizza Chili and everything else I served that night. She and her husband both loved it. 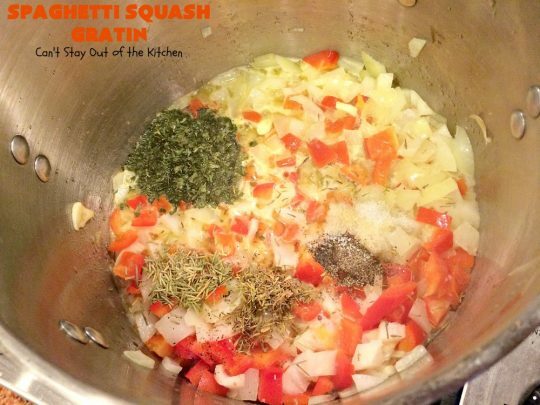 If you’re looking for a way to use up spaghetti squash, or you’d like a different way to prepare it that’s quick, easy and delicious, then try your hand at this recipe sometime. It’s great for a Meatless Monday dish, as a side dish, and it’s also great heated up for leftovers! Spaghetti Squash Parmesan is healthy and clean although it’s not exactly low in calories since it’s in a cheesy, cream sauce. We loved this savory and tasty way to serve spaghetti squash and hope you will too. Spaghetti Squash Gratin is a fantastic meatless main dish recipe. Each spoonful is fantastic! 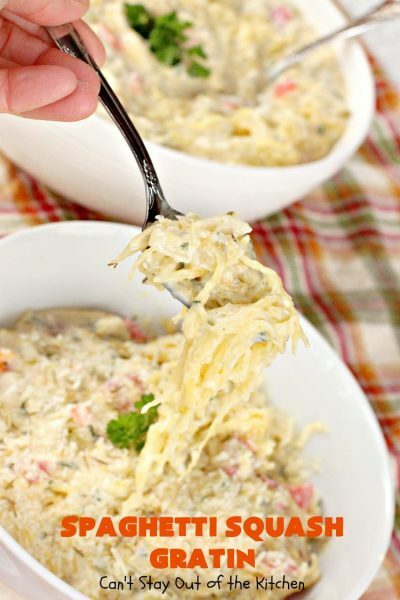 Spaghetti Squash Gratin has such a creamy, cheesy sauce seasoned lightly with thyme, parsley and rosemary. 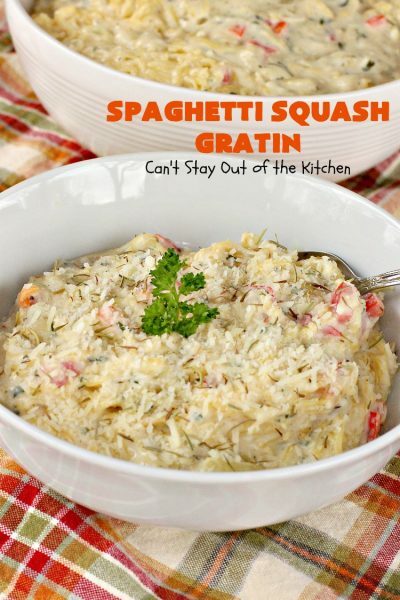 This is a great way to use up spaghetti squash. Bake spaghetti squash in a 350 oven for about an hour. 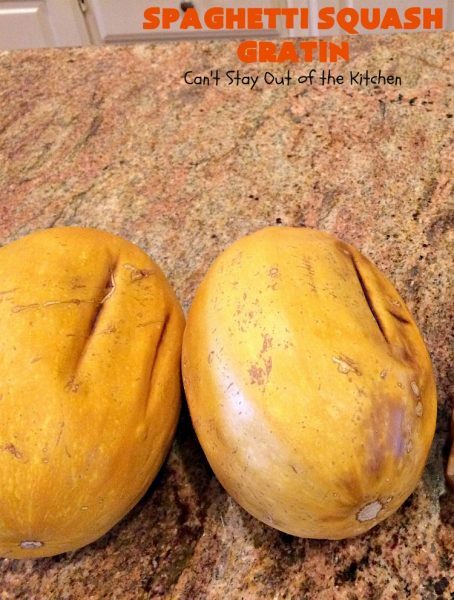 Cut squash in half, remove pulp and seeds, and remove the squash from the shell with a fork. Set aside. Meanwhile, prepare sauce: Melt butter in a large saucepan over medium heat. Add onions, red bell pepper, and garlic. Saute until veggies are tender. Add parsley, thyme, rosemary, salt and pepper and stir to combine. Work in gluten free flour with a whisk. Add half-and-half about 1/4 cup at a time until all the cream has been added. Then add milk or additional half-and-half. Stir until all the milk/cream has been combined. Add Italian cheese blend. 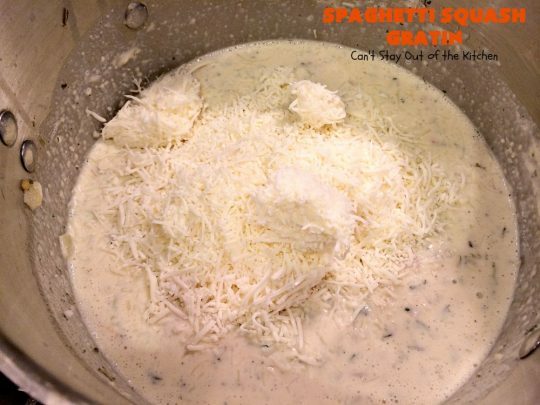 This H-E-B Italian 6-cheese blend has mozzarella, parmesan, romano, asiago, provolone and fontina and is one of the best cheese blends we’ve ever tasted. Add spaghetti squash to the cheese sauce. Stir to combine and heat through. 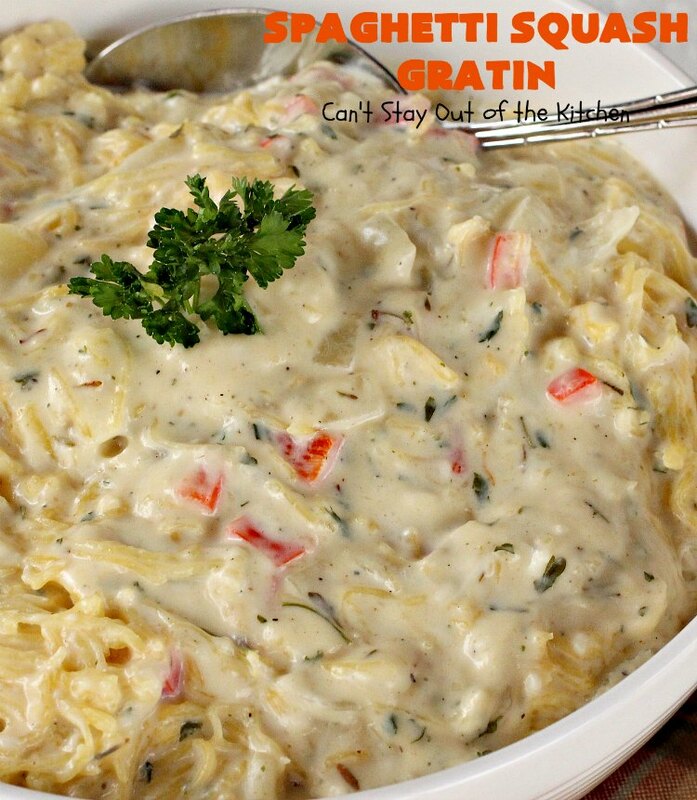 To serve: ladle Spaghetti Squash Gratin into bowls. 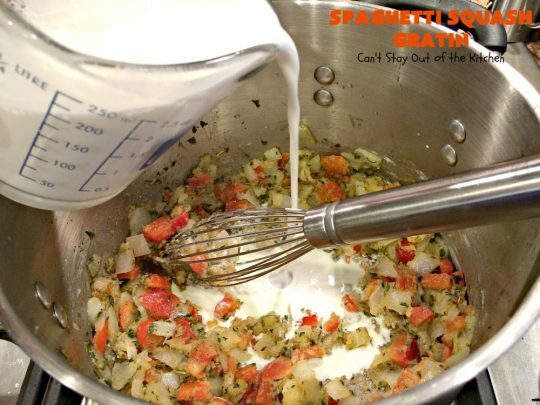 Sprinkle with additional cheese, thyme, rosemary, and parsley for garnish, as desired. 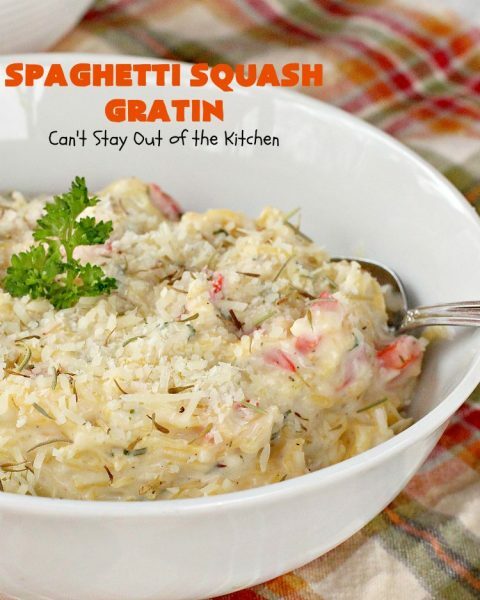 Spaghetti Squash Gratin is a clean eating recipe that’s gluten free. Our company loved the savory tastes of this delicious casserole. I highly recommend this dish for holiday menus. Delicious spaghetti squash casserole in a rich, creamy, cheese sauce and seasoned with thyme, rosemary and parsley. This meatless main dish is excellent. 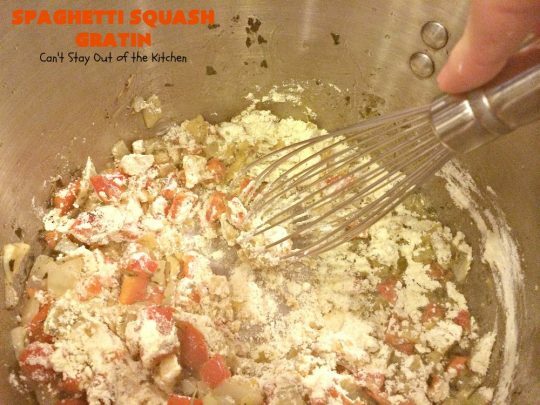 Bake spaghetti squash about an hour at 350. Set aside to cool about 15-30 minutes. Slice in half, remove pulp and seeds and remove the strands of spaghetti squash with a fork. 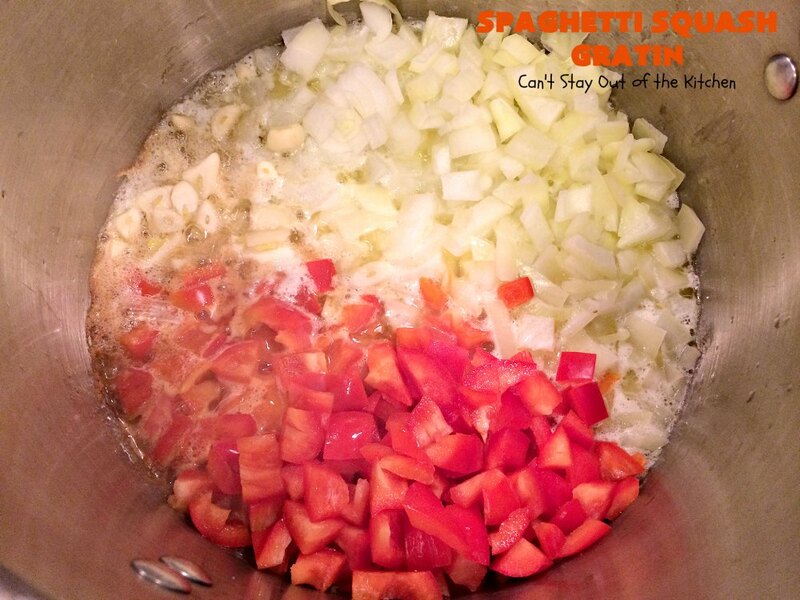 Add onion, garlic, and red pepper and sauté over medium heat until veggies are tender – about 5 minutes. Add salt, pepper, thyme, rosemary and parsley and stir to combine. Add flour with a whisk. Slowly stir in half-and-half and milk about ¼ cup at a time until all of the liquid is incorporated into the veggie mixture. Add Italian cheese blend and combine. Heat through a minute or two until the cheese melts. Add spaghetti squash and stir to combine. 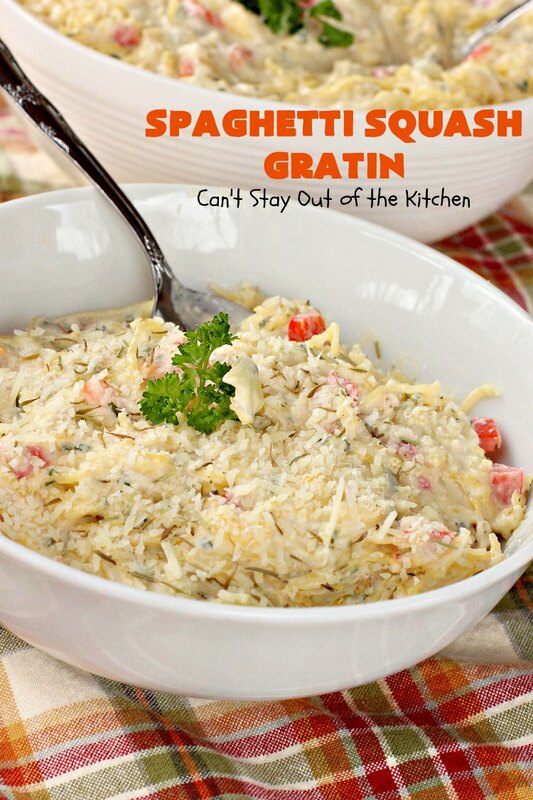 Serve garnished with more cheese and seasonings if desired. 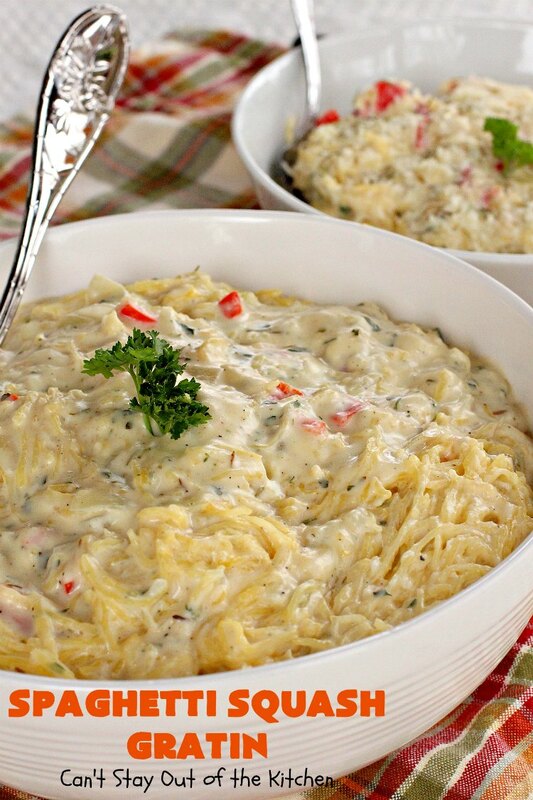 The cheese sauce for spaghetti squash is amazing. Here’s a spoonful for you! Spaghetti Squash Gratin is a terrific side dish for Thanksgiving and Christmas too. Can the spaghetti squash parm be frozen? Yes, Susan. You can freeze this recipe. That looks wonderful, Teresa! 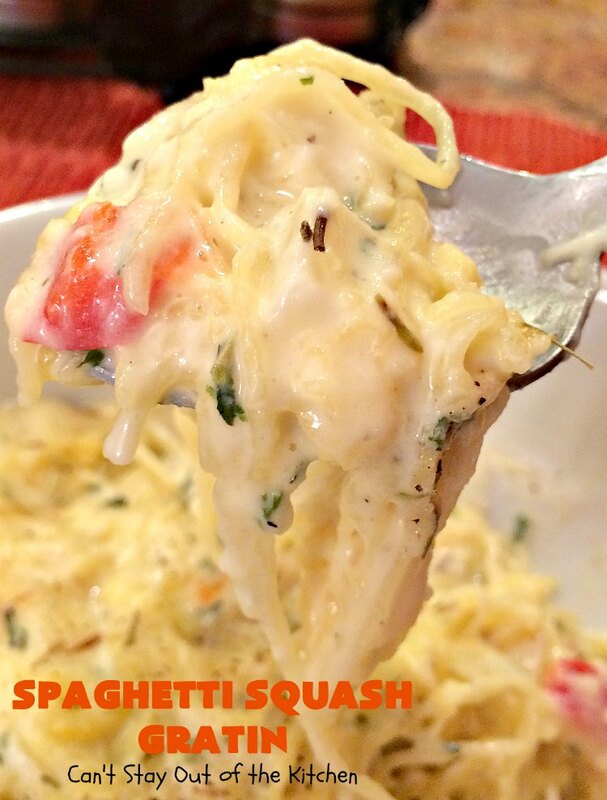 I love spaghetti squash. What a great way to fix it. It looks so creamy and comforting. I love the addition of the herbs, too. Thanks for another great recipe! Yes, it was so tasty. 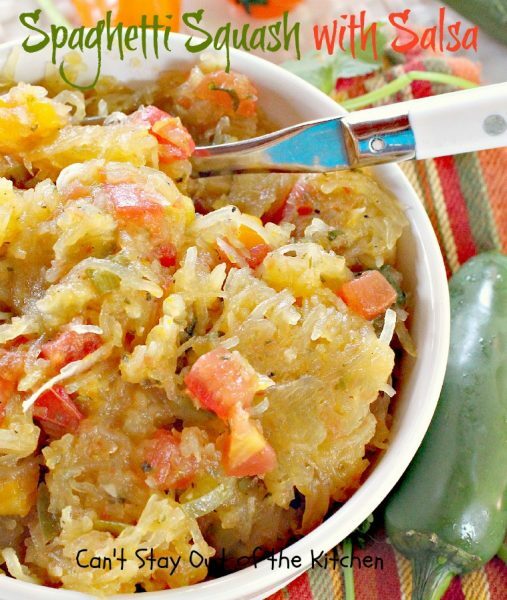 If you plant spaghetti squash in your garden this year, this may be a great way to prepare it! Thanks again for stopping by. You’re a great encouragement to me.